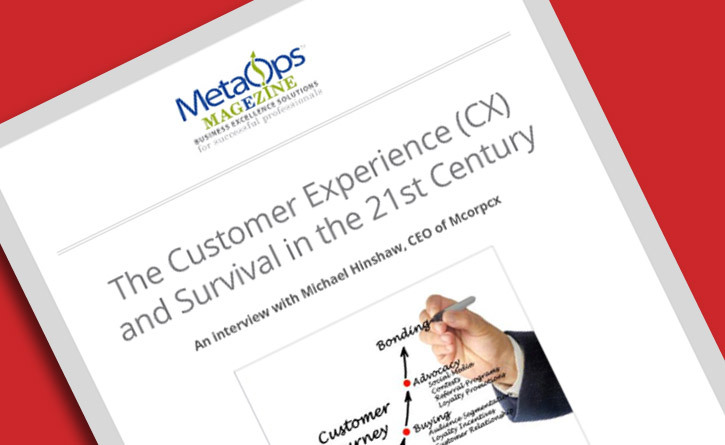 MetaOps Magazine interviews Michael Hinshaw, CEO of McorpCX, about Customer Experience and meeting customer experience expectations. Michael Hinshaw is the CEO and founder of San Francisco based McorpCX, one of the leading companies focused on bringing companies and customers closer together. With over 15 years in the business, he offers up some excellent insights and ideas on how to design, implement and track improvements in the all-important customer experience (CX). Hinshaw: For the most part, the customer experience is the sum total expectation that a customer has or expects to have with a company. Those experiences and expectations can come from many different “touch points” such as telemarketing calls, sales staff, customer support, marketing literature, and even from conversations from others about their experiences with the company. However, the real customer experience is always compared to a standard of expectation of what the experience should be. Indeed, those who have experienced top level customer experiences have different expectations. Increasing competition and the drive for differentiation are pushing higher and higher customer experience expectations. MetaOps: We hear much talk about customer service and for the most part, customers have pretty similar experiences-particularly with the national brands. Do you think industries are doing a good job at meeting the customer experience expectations? Only 11% of customer related initiatives took into account any actual customer input before rollout. Hinshaw: Before answering that question, listen to this statistic. A study was done by the Gardner Group that found that in major customer related initiatives, only 11% of those programs took into account any actual customer input before rolling out the programs. What that implies is managements feel very confident in their knowledge of what their customers expect. However, the data seems to show that confidence may be misplaced. Customer surveys are not enough to provide a good idea of what customers really feel about the experience and more importantly, how to improve that experience. Statistics show that 86% of customers will try other vendors after having a bad customer experience. And of course, about 9 other people will hear about that bad experience. To answer your question, many companies are doing a good job. But good is not good enough. To build loyalty and market share, a company must provide an outstanding customer experience that not only meets all customer needs but is constantly discovering new ways to improve and differentiate the CX. Here is another statistic that all companies, especially the largest need to pay attention to: by 2027 it is estimated by current projections that 75% OF THE S&P 500 WILL BE REPALCED. In fact, we are seeing that turnover happening on a regular basis right now. MetaOps: So, you are saying that there is a link between customer experience and company success? Hinshaw: Many companies are not innovating fast enough or reinventing themselves to keep up with customer needs. Even the most dominant brands of our time may fade into history. My feeling and experience has shown me that management must get out in front of changing consumption patterns if they want to survive global competition. They must learn to innovate and it is just logical that the customer become part of that process….from the very beginning. MetaOps: How do you do that? Customers don’t want to just be satisfied, they want to be delighted by the experience. Hinshaw: Our expertise is knowing how to bring the customer and company closer together. It starts with a gap analysis of what the actual customer experience is as compared to what the company thinks it should be. That knowledge doesn’t come from a simple survey that asks if the customer was satisfied with the experience. NO. Customers don’t want to be just satisfied, they want to be delighted by the experience. So, the most obvious first step is to see how to close the expectation and reality gap from a customer’s point of view. Sometimes it’s the little, subtle differences that can not only close the expectation gap but also create delight. The process is to investigate, analyze, design & innovate, implement and track. For the most part, customer input should play an important part in most of those steps. MetaOps: Today, we are all bombarded by people asking for feedback and surveys. How do you go about penetrating the clutter and collecting your data? Hinshaw: We find that if approached in the proper manner, we can get all the data we need. Our proprietary product- Touchpoint Mapping-is a unique technology that allows us to gather feedback from all of the company points of customer contact (Touchpoints). This allows us to create a very comprehensive analysis of the totality of the customer experience. The technology allows for setting up customized dashboards that can be accessed throughout the enterprise to track and benchmark what the customer is doing. So, much of the information is not just coming from the customer subjective surveys but from actual customer behavior at various levels and points in the customer experience. MetaOps: But gathering information about past behavior is reactive. How do you approach the need for innovation and past customer behavior? Hinshaw: We design what we call “Voice of the Customer” programs, which gather not only data about the experience but also queries for potential new needs and preferences. Indeed, we build a statistical basis for decision making and not just depend on perceptions that may be off-the-mark or not there at all. Remember how the Gardner study showed how little management thinks of customer input when designing new initiatives? We talk a lot about listening to the customer but that may just be so much lip service. And for companies to survive in the age of the smart customer who no longer needs a marketing department to help them decide their purchasing preferences, management needs to develop new, more transparent strategies. Today, information flows freely and instantaneously over a variety of media and devices and managements need to learn how to leverage that information. MetaOps: Do you have a number that can generally represent the benefits of getting closer to the customer? Hinshaw: Our experience demonstrates that after helping a company design and implement a project the customer response rates will double and sometimes triple. For example, most CRM mail blasts are happy to receive a 3% open rate. We know from our experience that we increase that number by a factor of 2x or 3x. Of course, conversion rates depend on many other things. MetaOps: You mentioned the need for companies to transform themselves. You also mentioned the need to close the gap between customer expectations and actual experience. How can a company make the leap from closing gaps to transformation? Hinshaw: It’s a management issue of asking the right questions. Management needs to be finding ways they can identify customer needs such as how to save time during the experience. Management should be asking customers what they need and what they would like to have rather than making that decision internally. If markets seem to be shifting, how and why are they changing and what can be done about it? Are customers’ needs and preferences changing? Are there new disrupter models moving into our markets? As we speak, McDonald’s is looking at the need to reinvent itself. Who would have thought this would be happening? Indeed, the future McDonalds may not look anything like it does today and it’s possible the company may have little to do with hamburgers and fries. However, it will take brave management and open-minded stockholders and investors to hang in there. But if management knows where customers are going, it makes it a lot easier to plot a new course. So, gap closing and transformation are part of the same strategy of leveraging our customers’ input to help guide us to where we need to be. MetaOps: Any general message you’d like other CEO’s to take away? Hinshaw: It just makes good sense to get as close as possible with the most important player in your business-your customers. Constantly monitor and define your markets, segments and your customer journey. Identify any pain or ways to make the customer experience easier, more pleasant and a fun thing to do. Constantly be gathering and analyzing qualitative and quantitative customer experience data and include customers in the process of helping the company innovate. If you are not sure how to go about developing a Voice of the Customer program, there are resources out there….like McorpCX to help you.